Have a deadline? Trying to finish your novel in a week? Trying to revise before your eyes fall out? Need motivation? A kick in the pants? Something that makes you stop sobbing? Sometimes an upbeat song helps. If I share mine, maybe you’ll share yours? How about you? If you have a song that forces you up and keeps you going pounding those words on the page, do share. Maybe I’ll add yours to my motivating playlist. I have less than two weeks to finish the first draft of this new novel. I’m going to make it this time. I know there will be rounds of revision after this, so I really should let go and turn this in. But… yeah… I need the story to have an end first. While I finish this draft, I’ll be away from Twitter and Facebook. I’ve turned off notifications, so I won’t see Facebook messages or Twitter DMs until the draft is done. That will likely be Tuesday, September 6. • My emergency writing retreat was a great success. I revised a section, wrote a good chunk of new pieces, and plowed ahead into the blank expanse. While there, the novel topped 70,000 words. The secret was going away with another writer—a writer I admire, and a writer who is also on deadline. We kept each other working and I’m stunned at how much I got done in just three nights. The other secret is being in a place where you have to pay for internet access. I refused to pay… and without wifi my mind was wonderfully cleared of static so I could write. • Even so, the book isn’t done yet. • I am going to the 2012 AWP Conference in Chicago—I’ve registered, booked a cheapie plane ticket, and even got a hotel room. Will I see you there? Guess what sold me on going: the keynote speaker. Did you know that Margaret Atwood made me want to be a writer? Here’s a post I wrote about Cat’s Eye some years back. • I love how I keep distracting myself with future things like this when the book isn’t done yet. • I am also going to another artists colony! I’m excited to say that I got accepted to the Djerassi Resident Artists Program for 2012, and I’ll be spending a month there, in the Santa Cruz Mountains outside San Francisco, this spring. I can’t believe it! • Too bad I’m not headed there tomorrow, since the book isn’t done yet. • I got my first-ever tattoo yesterday, a single word on my arm for my sister, in memory of our trip to Paris, and for our connection to each other. She was getting it first and I wanted to match hers, so yesterday we had them done together. • And I’m really feeling it now. The panic… because I know I’m so close, because I have such grand expectations and I don’t know if I can fill them, because I worry if this new book will meet up to the book that came before, and, of course, simply because THE BOOK ISN’T DONE YET. See you again once it is! This week I had a medical procedure, then I crashed out and slept all day in recovery, then I skipped town to a secret location to FINISH MY NOVEL PLEASE. You know the situation is dire when you have to leave all you know to have a hope of finishing the book by the day you said you’d finish it, and dire still when you slip into a tailspin of all caps and BEG THE UNIVERSE PLEASE LET ME WRITE TO THE END OF THE NOVEL THIS WEEKEND. The Hudson Valley YA Society event with Micol Ostow at Oblong Books in Rhinebeck went really well—and what a great experience to read with Micol! I wanted to thank the store for having us and thank everyone who came out to see us. Thank you! I’ll post some photos on my website when I get home. I’d say more, but I have a temporary login for wifi and it won’t last much longer. Hudson Valley YA Society Event This Sunday! I’m excited for this event this Sunday, August 14, at Oblong Books in Rhinebeck, New York. Not just am I excited to be a part of a Hudson Valley YA Society event—I was so jealous when I first heard it was forming and wanted to move back home to the Hudson Valley just so I could be in it—but I’m also excited about the other author who will be there with me. You may remember my interview with Micol Ostow about her new novel family. You may well know that I love this book, so you can probably only imagine how much I’m looking forward to reading with her. You see, I’ve known Micol for a long time. Quite a few years ago—let’s not count—when I had nothing published to my name and was fresh out of my MFA program, I got a day job as a copy editor at a mass merchandise children’s publisher. You know, because having an MFA in creative writing really doesn’t help pay the bills. Micol worked at this publisher, too—as an editor. I’m not sure how many years we worked there together, so very very stressed since that was a stressful job… maybe two years? Because she left before I did. I still vividly remember the day she told me she was leaving to pursue her own MFA (at the wonderful program at Vermont College of Fine Arts in Writing for Children and Young Adults) and to write full-time. I was so excited for her, so impressed at how hard she worked, since I don’t think there was a day I knew her when she wasn’t under deadline, and I remember thinking… I want to be like Micol one day. I want to work that hard, and believe in myself, and make it happen. She did. And you know what? I think I did. And now… now, years later, we’re going to be reading our novels together at a bookstore event, a thing I don’t even think I could have foreseen that day she came into my office at our stressful former day job, closed the door, and confided that she was giving her notice so she could go off and pursue her dream. Can’t wait for Sunday, Micol! If you’re in the Hudson Valley this weekend, I hope you’ll come see us. Sunday, August 14, at 4pm at the Oblong Books in Rhinebeck. I’m now back from the 40th Anniversary SCBWI conference in Los Angeles and I’ve been meaning to tell you what happened. The problem is that so much happened, I can barely get my head around it. And even more so because, when I originally registered for this conference and made my plans to go, I didn’t think I’d actually be a part of it. Look at what it says on the bottom. Why am I telling you about John Green? Because, due to the last-minute cancellation, I ended up being his understudy for one hour. (Sort of.) I did a session with my editor and my agent billed as a “Three-Way Conversation” in which I actually sat at a table with the both of them, speaking into a mic about my experiences with Imaginary Girls and working with them to bring the book to life. Pinch me. Here’s a photo taken by the hilarious and even-more-amazing-in-person Mike Jung during that session. I don’t care that it’s blurry—it’s my only evidence that it did, indeed, happen. See that table far, far at the head of the room? See those three people sitting at that table? I’m the one on the left. My brilliant editor Julie is next to me and my brilliant agent Michael is next to her. Session at SCBWI LA in which I am not in the audience, which is weird! • Eating an utterly delicious dinner with my agent Michael, where we talked about my future as an author (a future he thinks I do have!) and where I admitted that I wanted to write something I was afraid to admit I wanted to write… and discovering he was absolutely beyond supportive, and how could I have expected otherwise? • Getting to meet seven of my agent-sisters—okay, six of my agent-sisters: Jill Alexander, Brodi Ashton, Tracy Clark, Sara Wilson Etienne, Bethany Griffin, Emily Wing Smith (twice my sister, since we share an agent and an editor)—and not an agent-sister but still an agent-mate Bryan Bliss, who I ran into on the way to the mall my first hour in LA and roped him into going with me grocery shopping. I heard there was at least one agent-sister I did not get to meet and I’m sad because that messes up my streak. • Getting to meet many other writers I knew from online, so many I can’t even gather up the names! • Selling out of all the copies of Imaginary Girls that I’d brought for the PAL member book sale within fifteen minutes, so my editor couldn’t even find me in the room because she was looking for the table with my book cover displayed and they were all gone. Shannon Messenger, me, and Casey McCormick. Note: I am short. • Hearing brilliant and inspiring authors I admire speak including Judy Blume, Laurie Halse Anderson, and Libba Bray (who rocked killer silver sneakers and who is inspiring no matter where and when I meet her). • Seeing my friends from college after many, many years apart. • Witnessing my editor Julie talk about my book on her panel—and surely blushing at the compliments, and definitely feeling extra-special and honored and thrilled to be a part of her list, along with John Green and Gayle Forman and Stephanie Perkins and Emily Wing Smith and Nina LaCour and more. • Did I mention Nina LaCour?? Meeting an author whose book I love, love, love—Nina LaCour, author of Hold Still—while wearing PAJAMAS. (Only I was wearing the pajamas; she had on normal clothes.) She is lovely. I can’t wait to read her new book, coming Spring 2012, called The Disenchantments. • And related, hanging out with my editor WHILE WEARING PAJAMAS—while, again, she wore normal clothes. (Here I should probably point out that I was not idly wandering the hotel grounds in pajamas; the Saturday night gala had a “pajama party” theme.) Still, it’s best to appear professional and put-together in front of your editor, especially when you’re writing a novel imminently due on her desk, isn’t it? Well, all that went out the window Saturday night. • Hosting the recording of a podcast for Authors Are Rockstars in my hotel room with authors Cindy Pon, Holly Goldberg Sloan, and Suzanne Young, and attempting to not say anything stupid. Did I succeed? Here, have a listen! The event organizer, Alyson Beecher, speaking while Holly, me, and Suzanne look on. Photo thanks to Alethea Allarey. Me reading IMAGINARY GIRLS... photo thanks to Jenn Reads Fiction. Q&A time... Cindy, Holly, me, Suzanne... photo thanks to Alethea Allarey. Signing books. Thanks for the photo, Jenn Reads Fiction! 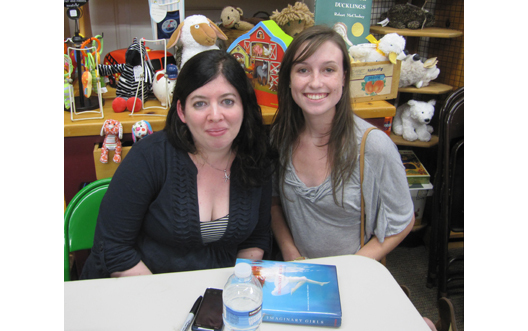 And one last one signing books, with Lauren from 365 Days of Reading! Thank you so much to everyone involved with Bridge to Books for organizing such a great event and making it possible for me to do a bookstore signing while in town for the conference! • Returning to the hotel after the signing and collapsing on my bed, in the dark, for an hour… it was a big day for me. I’m a shy person at heart and all the public-author things are hard on me! • Helping my editor teach her intensive class—and bringing the class cookies. My editor was teaching an intensive class on revision the Monday after the main conference ended, and you won’t believe this, but she asked me to help her! We shared our editorial correspondence for Imaginary Girls: every edit letter and response, going through all the five rounds we spent revising the book. Getting the chance to read those letters back after the book was done and undeniably out in the world was truly one of the more surreal experiences of this conference. And then knowing all these strangers could read my edit letters and emails to Julie, too, pieces I never thought anyone else but me, Julie, and Michael would see… I hope they found what we shared helpful. I know it was an honor to be at the head of the class with Julie and talk about our process turning the book into what it was meant to be. I still can’t believe I got to do it. • Getting room service and pocketing all the jam. Personally, I think you must get room service at least once when you stay in a nice hotel. I ordered breakfast the day I was to do the session with Michael and Julie in the morning and the bookstore event in the afternoon. If any day deserved room service, it was that one! I ate breakfast in bed, and lounged around, and it sure helped me relax before going out and talking in front of a whole load of people. • Hanging out and meeting many, many people in the lobby. I’m not often a social creature, but for some reason I wanted to be at this conference. I got to talk to many people in the lobby and bar area of the hotel—and put faces to those I know from Twitter. I know there are quite a few people, too, who I missed meeting! I wish I could have met everyone. • Getting inspired. There were numerous moments during the conference where I felt on fire and ready to return to my novel. This conference is a rewarding, motivating experience, and if you’re a member of SCBWI, I really think you should try to go at least once. I may never go again… but I’m so thrilled I got to be there this year. • Sneaking in a couple hours here and there of writing. And even with all of the above going on, I still found a couple hours to write. There was one moment, at night, when I was down in the lobby writing in a comfy chair near an outlet (to avoid being too close to my comfy bed and being tempted to curl up in it) when I pounded out the rest of a difficult scene amid the crowds, and maybe it was the energy of the place, of the weekend, of the people, that fueled me, but it was quite a moment. • Packing up with the determination to finish my novel THIS MONTH. • Seeing a lightning storm flashing through the night-lit clouds as I flew home. What am I forgetting? A great deal, I’m sure. It was a whirlwind weekend and I still can’t be sure much of it even happened. I’m glad I went. Thank you, SCBWI and Julie and Michael and Once Upon a Time and Bridge to Books and Authors Are Rockstars and everyone and anyone I might be forgetting! Next up? 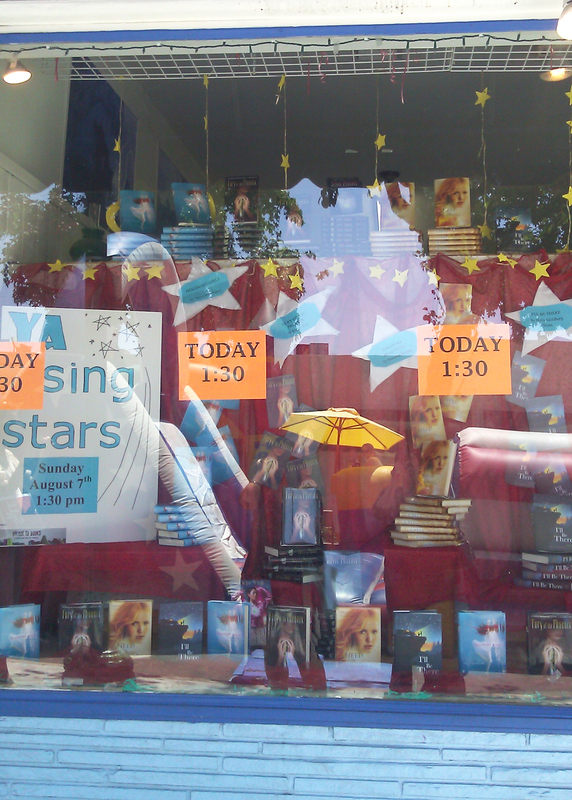 Oblong Books in Rhinebeck for a Hudson Valley YA Society Event with Micol Ostow this Sunday! Congratulations, Hannah Loraine! I’ll contact you soon for your mailing address. I hope you love this book as much as I do. I leave for Los Angeles early tomorrow morning. If you’re attending the SCBWI conference at the Hyatt Regency Century Plaza in LA—and even if you’re not, because I am venturing away from the hotel one day—this post tells you where to find me. If you want to. 6:30–8:00 p.m. I’ll be selling copies of Imaginary Girls at the PAL member book signing—well, I hope I’ll be selling copies, because I do not have any room in my suitcase for them if I have to lug them back home to New York! And if you have a copy of Imaginary Girls with you, you’re welcome to bring it here then too, and I’ll sign it. And tell you thank you for reading it, you are very kind. 10:45–11:45 a.m. Come see me along with my phenomenal agent and editor in this panel: “A Three-Way Conversation: The Author-Agent-Editor Relationship,” in which I’m the author, Michael Bourret is the agent, and Julie Strauss-Gabel is the editor. And in which I’m a very lucky writer, because they’re both amazing. 1:30–3:00 p.m. If you’re not at the conference, please come to this “YA Rising Stars” book signing and reading sponsored by Bridge to Books and featuring me, Cindy Pon (Silver Phoenix), Holly Goldberg Sloan (I’ll Be There), and Suzanne Young (A Need So Beautiful). I’m excited! More info about this event can be found here. Oh! And I’m also recording a podcast for Authors Are Rockstars while in LA—with other authors, too—and I’ll let you know once it’s online! This is my second visit to LA. My first visit was with my other half, when we touched our toes to the Pacific Ocean, ate the best strawberries in the world at the farmer’s market, adventured to the desert, stalked David Lynch, stayed at a skeezy hotel in Hollywood, felt palm trees for the first time (my first time, anyway… how could I not touch them? ), and deliriously decided we wanted to move out there. …Even though I can’t drive. Somehow, though, life and sense intervened and we stayed put in New York City. I’m excited to go back to LA, and this time for awesome bookish things. I’m excited to see some of YOU. If you see me, say hi. p.s. Even though I’m going away, I’m still giving away an ARC of Brooklyn, Burning while I’m gone. Enter here! I’ll send the ARC to the winner when I get home.